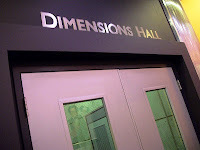 Dimensions Hall is one of those areas that most guests breeze by on their way to the ride vehicles for Journey Into Imagination with Figment. As the attraction rarely has a wait, or one that requires more than a five minute wait, the areas further back along the queue, such as Dimensions Hall, rarely get the attention they deserve. For those who have every looked in through the windows on the double doors of Dimensions Hall, the trick your eyes play on you is immediate. It appears to be a much larger hallway than the actual space takes up. 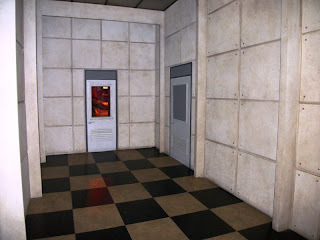 No, this isn’t Time Lord technology, it isn’t actually bigger on the inside. The telling part of the hall is when you see a guest walk by the door at the other end of the hall, their heads passing by the window look enormous! 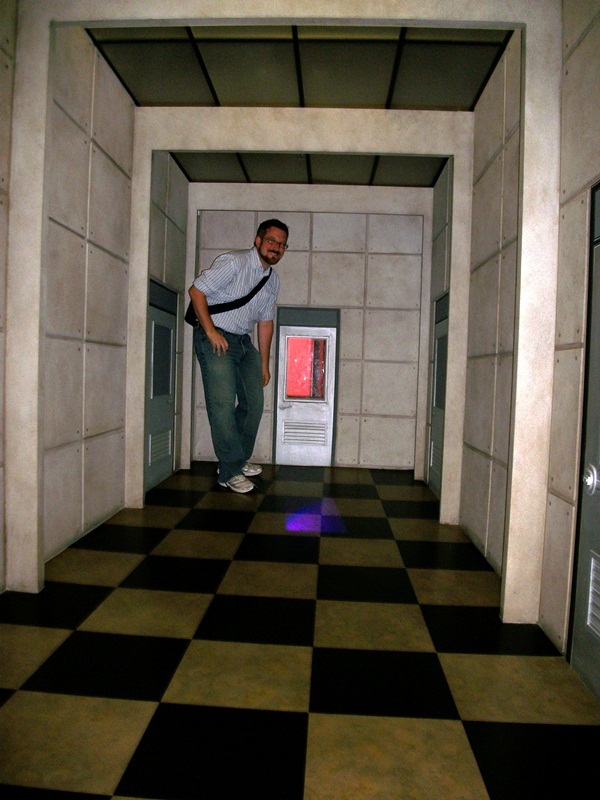 Of course, this is all being done by forced perspective, a trick utilized throughout the parks of Walt Disney World, though usually to a less visually shocking result. 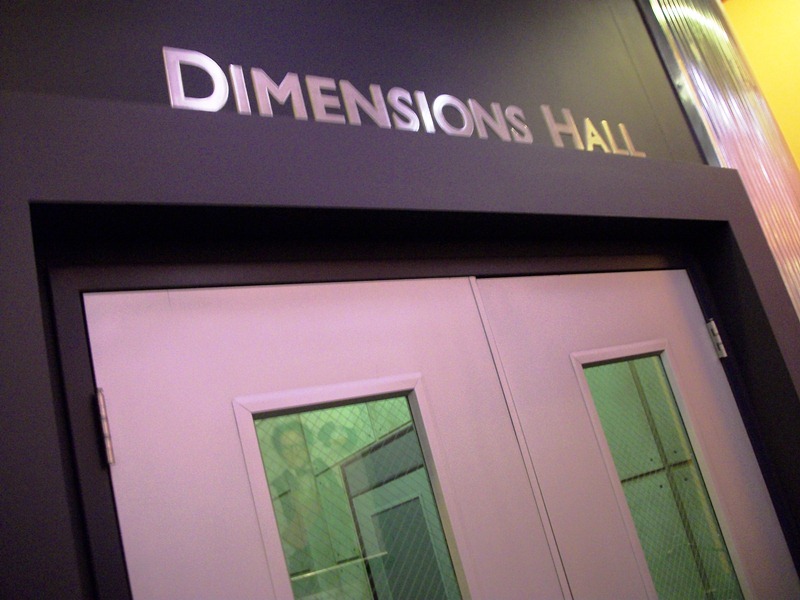 So, what does Dimensions Hall look like on the inside? I’m glad you asked! 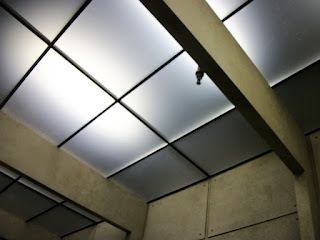 As it so happens, I ended up being in the right place, at the right time, taking the right picture and was able to step inside Dimensions Hall this spring. In other words, I was doing my usual ‘must take a picture of everything’ routine, craning my camera for the best shot of the hall’s effect, and was asked by a Cast Member if I’d like to go inside and have them take my picture. 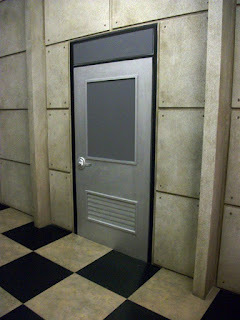 As if I would ever say ‘no.’ So, dear readers, you get to peer behind the curtain with me today! Oh, and for those wondering, yes, I did feel like Willy Wonka in the moment! I have never been more jealous of you than I am right now. It was pretty amazing, especially since it just happened because I was in the right place at the right time!